Aaj is article me hum blogger or wordpress se comment date remove karna shikhenge. 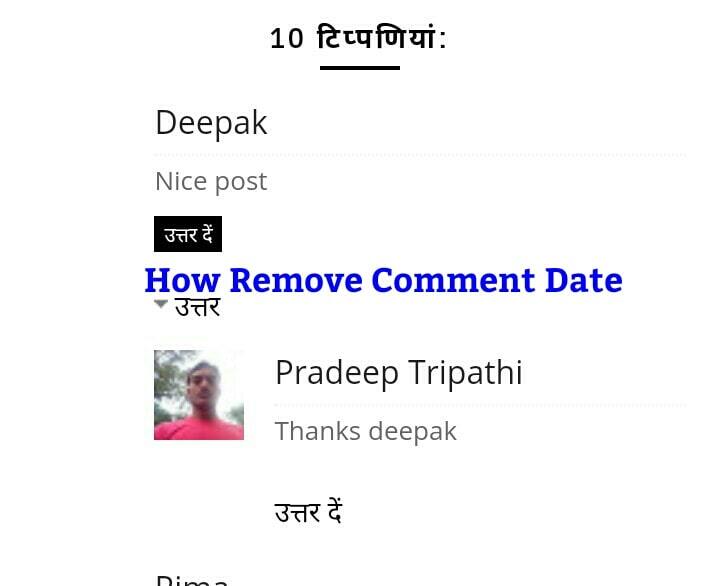 Comment date hide karne se koi bhi user nahi samajh pata hai ki kis date ko wo comment kiya gaya tha. Ab chaliye blogger or wordpress me comment date remove karte hai. Iske liye hum two steps me batayenge. Ek to blogspot blog ke liye to dusara wordpress walo walo ke liye. So apka blog jis plateform me hai use hi follow kare. 1. Sabse pahile blogger me login Kare aur layout me click Kare. 2. Ab sabse upper theme deginer ka option hoga usme click Kare. 3. Ab ek page open hoga jisme Kai menu honge unme se advance me click Kare. 4. Ab add css me click Kare. Ab apke samane ek box khulega jisme neeche diya gaya code copy karke paste kar de. 5. Ab right side me apply to blog menu hoga. Usme click Kar de. Ab apki bloger website se comment date hide or remove ho jayegi. Iske liye aap apna blog open karke check Kar sakte hai. Aur jab bhi comment date ko fir se show karna hai to to css code remove Kar Dena hai Jo apne paste Kiya tha. Chaliye ab wordpress me comment area se date hide karna janate hai. Iske apko kuchh code paste karne hoge. 1. Sabse pahile wordpress dashboard me Jaye aur ydi website login hai to login Kare. 2. Ab neeche diye gaye code ko copy Kar le. 3. Ab worpress dashboard me search apprearnce me Jaye aur editor me click Kare. Ab yaha function.php ki file milegi jise open karna hai. Ab isme copy Kiya hua code is php code ?> Se pahile paste kar Dena hai. ?> ko php closing tag bolate hai. 4. Ab update file me click karke update kar de. 1. Sabse pahile apne comments area me Jaye aur aur mouse se at or posted ko select Kare aur right click Kare. Ab inspect element me click Kare. Ab apko yaha se div or span tag ka class name copy karana hai. 2. Ab neeche diya gaya code bhi copy karna hai aur notepad me paste kar de. 3. Ab copy kiye hue code ko wordpress me css external me paste Kar ke update kar de. At last blogger ya wordpress se comment date kaise remove karate hai, wali ye post apko kaisi lagi comment me jarur bataye. Pichhali post me Maine blogger google amp ke bare me bataya tha. Aap logo ne kafi positive comment diye the. Thanks to all. Thanks jamsed ji hum daily update karane ki koshish karenge.